Happy Halloween! I hope everyone dropping by will have a safe and enjoyable celebration. This Halloween finds me operating the Mayall 4-meter telescope instead of trick-or-treating, but I do plan to bring some spooky reading with me to the telescope to celebrate the occasion. Today also marks the ninetieth anniversary of Harry Houdini’s death. Houdini fascinated me as a kid and the more I’ve learned about him over the years, the more he intrigues me. Not only was he an amazing escape artist and magician, but he was a pioneer in both cinema and aviation. However, what has always fascinated me most was Houdini’s work as a skeptic. 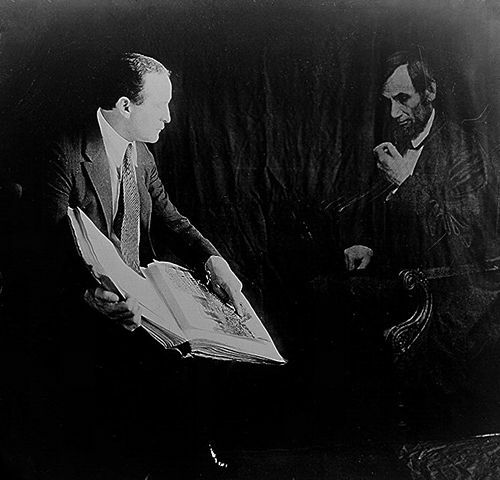 The photo below shows Houdini in a “spirit” photograph of him interacting with Abraham Lincoln through the magic of a double exposure. Houdini became interested in the occult and spiritualism after his mother died in 1913. He wanted to contact his mother beyond the grave. However, back in his early days as a performer, he masqueraded as a spiritual medium himself and began to recognize that the mediums he contacted had just updated and recycled tricks he himself once used. Ashamed of his own past, he started a crusade to expose fake mediums and show people how they performed their tricks. By 1925, Houdini’s show went from his familiar routine of escapes and magic tricks to showing how psychics and spiritualists performed their tricks. Houdini chronicled his exploits in a book entitled A Magician Among the Spirits which he co-authored with C.M. Eddy Jr. Reportedly, it’s this book which cost Houdini his friendship with Sir Arthur Conan Doyle, the author of Sherlock Holmes. In 1926, Houdini planned to start a new book about religious miracles with C.M. Eddy Jr. and none other than H.P. Lovecraft. Although an outline and three chapters were written, plans for the book were derailed by Houdini’s untimely death later that year. Despite Houdini’s efforts to debunk the paranormal, his widow Bess went on to attempt to contact her dead husband through the aid of spiritualists. It’s said her final attempt happened eighty years ago tonight on October 31, 1936. The séance was broadcast on the radio. The medium, Ed Saint, called out on to Houdini to make himself known, but no answer came. After an hour, Bess called an end to the séance. At that point, a very localized, violent storm broke out. Supposedly it was clear over the surrounding area. It only rained over the séance location. I hope you stay warm and dry this Halloween and may all your encounters with ghosts and spirits prove pleasant ones. As long as I can remember, people have complained about Christmas decorations appearing in stores earlier in the current year than the previous year. This year is the first time I can remember people commenting—mostly in a lighthearted way, it seems—about Halloween decorations appearing early. As it turns out, I actually don’t mind a little lead time on the Halloween season. I love Halloween, but because of my observatory job, I only get a couple of weeks at home in a month. If I’m working on a writing or editorial deadline, I might not get to a store that has decorations to remind me Halloween is approaching until very close to the date. Also, although I attend several science fiction, steampunk, and comic conventions each year where cosplay is encouraged, I don’t often get to go full-out since I’m appearing as a professional on panels. Halloween is a definite chance to play. 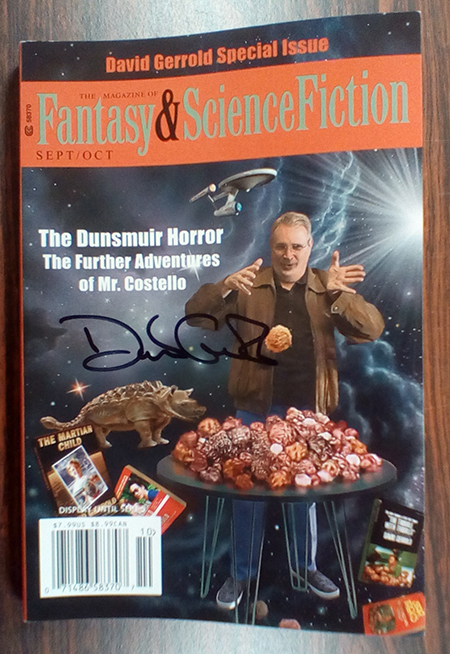 Speaking of conventions, when I was at Bubonicon in Albuquerque a couple of weeks ago, I picked up a copy the David Gerrold Special Issue of The Magazine of Fantasy and Science Fiction from Gerrold himself. He was kind enough to sign it for me. The issue has proven to be worth the money just for Gerrold’s fine science fiction novella “The Further Adventures of Mr. Costello” and Peter S. Beagle’s “The Green-Eyed Boy,” which is a prequel to The Last Unicorn. However, I’ve also been enjoying the fact that the issue contains several spooky tales about ghosts and murder most foul. It’s done a great job getting me into the Halloween frame of mind! As an aside, David Gerrold is actually the first professional science fiction author I met. We met at a convention in California circa 1981 and he signed my copy of his book The Trouble with Tribbles which told how he created the Star Trek episode of the same name. 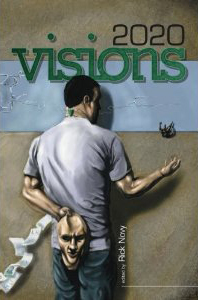 I was honored to appear alongside Gerrold in the anthology 2020 Visions edited by Rick Novy. 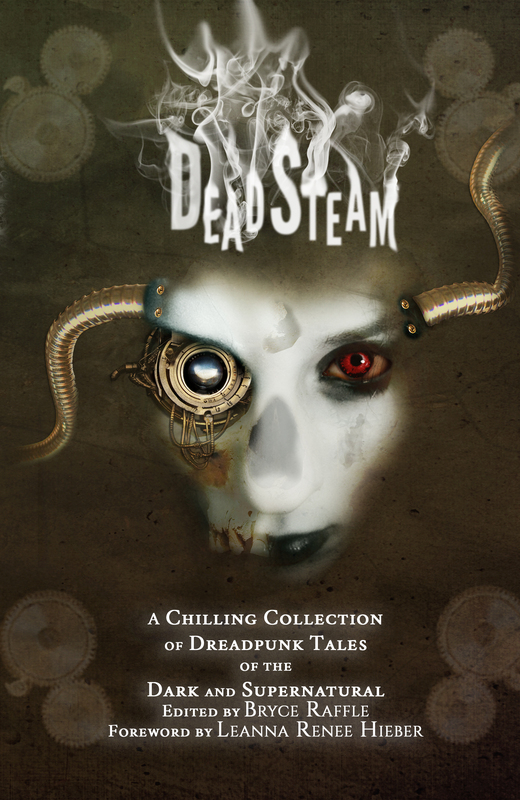 The anthology tells stories set in the year 2020. You only have a little more than three years to find how good we did predicting the future! Back on the subject of Halloween, this is one of those years where I have to work at the observatory on the big day itself. Unfortunately, that means I can’t really go all out on costuming this year, but I’m still thinking about dressing up. 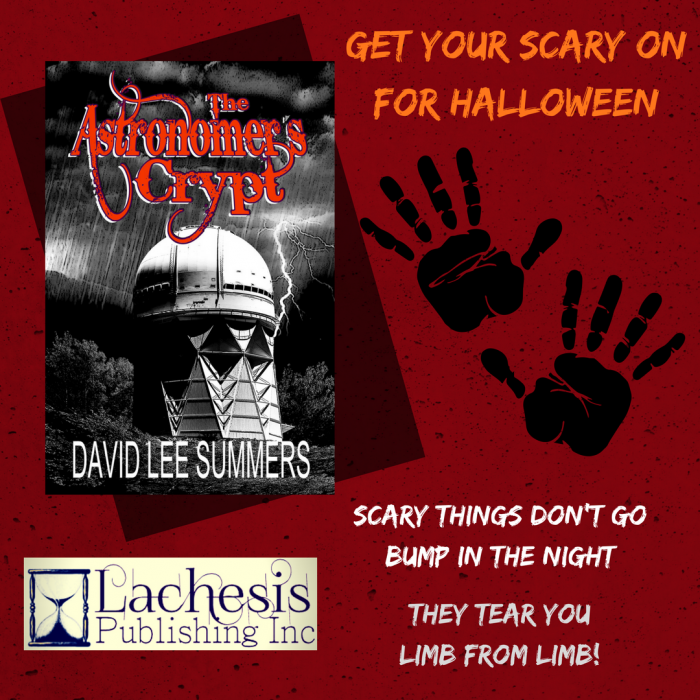 Perhaps I’ll go as an astronomer’s ghost in honor of my forthcoming novel, The Astronomer’s Crypt!